I recently spent a whole day learning several kinds of meditation and little relaxation skills from a Buddhist Lama. His is well known world wide but he only teaches a few people each year. The training is not in any way Buddhist/ religious or spiritual it is purely to learn how to relax properly, which has many positive results for your health and well-being. As a qualified meditation teacher I wanted to expand the solutions to stress that I offer my clients and students. 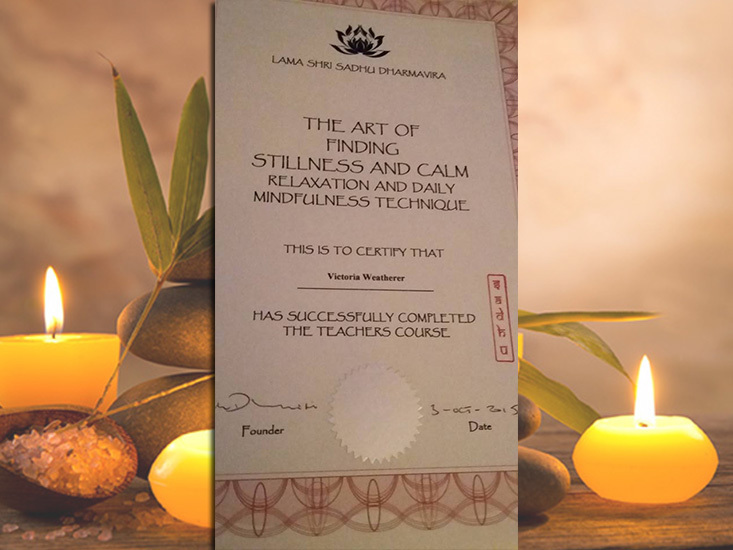 So after completing my Teacher Training I am excited to announce that I am officially approved by Lama Dharmavira to teach his relaxation methods to clients. The Art of Finding Stillness and Calm – Relaxation and Daily mindfulness technique. Workshops will begin on the 1st November, for one to one private lessons or group sessions if you have friends or family you’d like to learn with. Anyone over the age of 16 with an interest in learning how to relax is welcome, no previous experience necessary, you don’t sit cross legged and chant either, its all done in a chair or walking around. Should you have a disability that isn’t a problem , and just to prove that he isn’t that far removed from the real world, the Lama even taught a method of quick de-stressing/relaxing that can be done while you hide in the loo at work for two minutes of peace and quiet! My friend and I spent the afternoon and we were taught how to meditate. We learnt how to concentrate on breathing and finding calmness. We had a good laugh but have learnt a technique for life. Since then when ever I feel stressed I meditate and feel so much relaxed and deal with life so different. I can sleep better I am happier and It’s my time to myself to switch off.